Towards the top of Trafalgar St, a minute downstream from Brighton Station, stands the evocative Lord Nelson pub. It’s one of a handful of gems in the North Laine area that’s stayed true to its original incarnation as an honest pub, fit for a good pint. Inside there’s a traditional u-shaped bar with tables and chairs either side. A decent range of lagers and Harveys on tap. It’s deceptively spacious too with one half of the front space spreading far back into a large conservatory, ideal for eating and drinking. The menu is a sensible size, with two choices of beef burger available. There’s The Nelson, complete with smoked bacon, mature cheddar, giant onion rings and BBQ sauce. Followed by a hot and spicy number called Hell-Fire, lathered in chilli sauce plus cheese and served with optional sour cream to temper the heat. 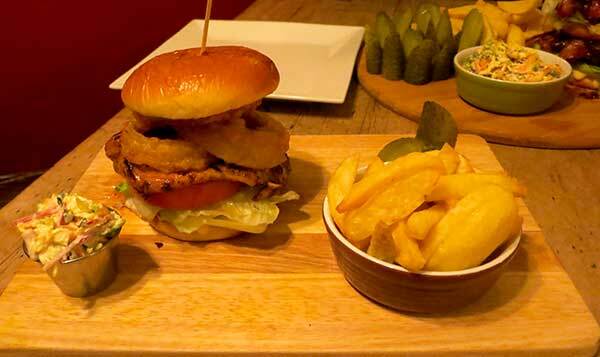 A Cajun chicken burger features too, which we ordered, as well as a mushroom and halloumi option. All are housed in brioche buns, with a slice of beefsteak tomato and iceberg lettuce. Sides of gherkins, coleslaw and chips accompany. For £7.50 it’s extremely well priced and the portions are more than healthy. You can add additional toppings, like roasted pepper or blue cheese for between £1 and £2. 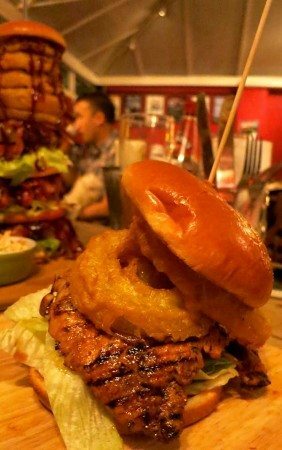 So to the bottom of the menu and specifically Nelsons Column, where it states – One huge burger, One person, One Hour. Can you handle it? There’s no hesitation in the smiling response, “It’s about a foot high”. ‘A foot high?’ I repeat out loud trying to comprehend what my ears have just heard. “One lad got ¾ of the way down and then had to lie down over there for an hour”, pointing at a bench seat behind me. With a dose of the meat sweats underway from just thinking about it, I headed back to our table, generously offering the Column up to my hungry pal. Service was in good time; the team behind the bar smiley and enthusiastic all evening. My chicken burger arrived first. Gladly, a tender piece of breast, aptly charred from the grill with a pleasing waft of black pepper and paprika infused spice emanating from the brioche bun, itself a picture of toasty sweetness. Mayonnaise, crisp iceberg, tomato and a giant onion ring make for a robust construction but nevertheless a tasty one too. The chips are chunky, nicely browned and well salted. The gherkins have some bite and are generously sized too; no place for miniature cornichons here. This is about big food with big flavour, though the coleslaw is finely cut and very pleasant too. A few minutes later and the Column is incoming. The pub has practically come to a standstill, most of the conversation has temporarily died away. If there was a record playing the needle would have screeched right across the vinyl to the sound of silence. We stare at the burger, it really is a foot high, maybe more. There are plenty of smiles from everyone, my friend is in mild shock but we end up laughing all the same. It is, at the end of the day, a great spectacle and bags of fun. 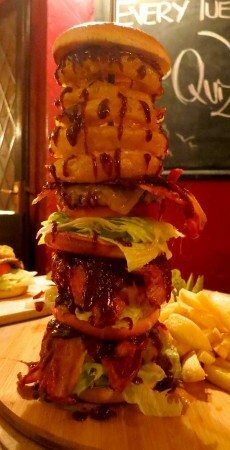 Incidentally this beast of a burger costs £25, refunded if the challenge is achieved. We both decide to get stuck in and see how it fairs. The Column is effectively three Nelson burgers stacked on top of each other. The patties are finely minced, adequately seasoned and cooked to well done with the tang of melted mature cheddar prominent. As before, there are the deep fried giant onion rings, iceberg leaves and tomatoes plus lashings of bitter sweet smoky BBQ sauce. 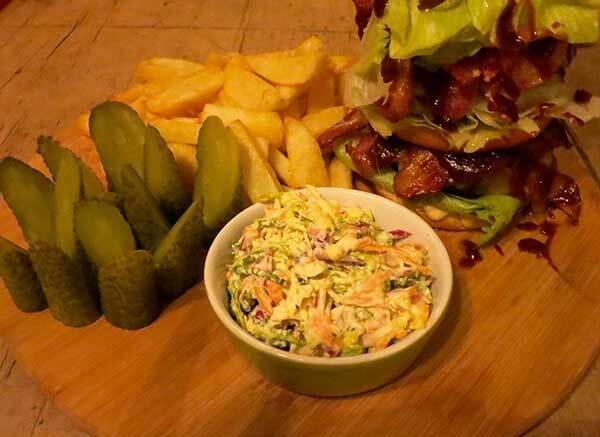 The smoky bacon is cooked to a crispy finish and its presence augments the overall flavour combination. This is a pleasingly rich concoction and leaving size out of the equation for a minute, a standard Nelson burger would be just as nice a thing, albeit more manageable for most. Between us we nearly finished it; half a bun, a few rashers of bacon and an onion ring or two leftover, though I did have to get a cab home. I suspect there are folk out there who could singlehandedly conquer the Column and if that’s you, the staff at the Nelson are more than happy to supply the goods. It certainly showcases their burgers well, which come highly recommended. Scores are based on the Column, but if it were a single Nelson burger.